I’d been feeling there was something missing from the summers of 2006-16. It finally dawned on me that what our calendar lacked during those years were trips to Funland. Our offspring had aged out of it, and Aiden wasn’t yet old enough to go. 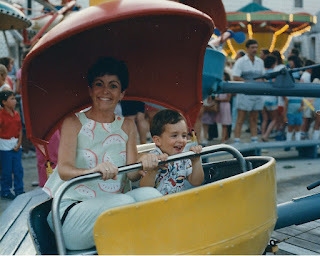 #1: it is amazingly inexpensive, especially the rides for the little guys and gals. Now you CAN drop a pretty penny playing Whack-a-Mole and Frog Bog, but being the klutz that I am, I so rarely won a prize that I stopped playing eons ago. The Seyfried rule was that if our preteens wanted to keep playing skee ball or whatever beyond a certain point, they had to pony up the cash themselves. #2: Funland is family owned and has been forever (by the Fasnacht family). They keep everything in pristine condition—no trash on the ground, no chips in the carousel horses’ paint. #3: The employees are great—teens from all over the world come to spend their summers working there, living in the Fasnacht-owned dorms, and making money for college. I have never witnessed a Funland worker being unpleasant to anyone, and most are very friendly--no mean feat when you have to start (loading kids in) and stop (helping them out) the fire engine ride a jillion times per shift. I learned when to go (1 PM on a sunny beach day is ideal for avoiding crowds), where to park, and how to time our visits for maximum enjoyment and minimum meltdowns (I’d aim for about 90 minutes). For more than 20 years this info served me well, but for the last kid-free decade it was useless knowledge. Then Aiden turned three. Suddenly Funland was on our schedule again. As I held his little hand and ventured in, I almost burst into tears, because recalling Aiden’s dad, uncles and aunts as children there overwhelmed me. Last summer was a trial run—at just three, he was only ready for a couple of (very) tame rides. But this summer? My four year old date and I had a blast! True, the only thing he “won” was a small stuffed whale, playing one of those “everyone’s a winner” games (just my speed). But he didn’t care, he loved it all—just as my kids had. We soared and dipped on the same helicopter ride that Sheridan and I had done in 1989, and it felt just right to continue this tradition with the next generation of my loved ones. How many Funland summers are ahead for me? No idea, but I hope many. There are so few places in my life that haven’t changed a bit, and sharing a special one with my grandchildren is a great, great joy. So, as August ends, Funland, I salute you. Thanks for the memories. I’m pretty skeptical about ghosts. I get a chuckle out of TV shows like "Ghost Hunters," purporting to show experts uncovering the eerie and supernatural, even setting up cameras to capture the spirit world. Really, how gullible can you be? When the girls and I were planning our trip to Ireland, Rose and Julie’s special request was to find a haunted castle to sleep in. They are two gutsy gals; to them, it sounded like fun. There are several haunted castles in Ireland. We settled on Ross Castle in Montnugent, a place known among aficionados for the ghost in its tower. Just in case, I booked a room on the lower floor (though my daughters would rather have been up when the action supposedly is). Upon arrival, we heard the tragic tale of Sabina Nugent and Orwin O’Reilly. Sabina was the daughter of the baron who owned the castle, 600 years ago. Orwin was a commoner. Their love could never be, but of course they fell in love anyway. One moonlit night, the pair was crossing Loch Sheelin, and the boat capsized. Orwin drowned; Sabina died of a broken heart. And it is Sabina who now roams the castle tower. Our hosts seemed completely at peace with Sabina’s co-habitation. They have had their furniture moved around over the years, but think she’s quite harmless. On our own that evening, the castle took on a certain creepiness we hadn’t noticed before. We decided to pull out Julie’s laptop and watch something funny. We were laughing away at some comedy special, and began to relax. At that moment, we heard a key turn, and the front door swung open to reveal…two definitely mortal sisters from Finland, also at the castle for the night. They looked forward to sleeping in the tower, because they wanted very much to see Sabina. They said their house in Finland was also haunted, and they were accustomed to living with apparitions. They said good night, heading for the stone staircase and their hoped-for rendezvous with the world beyond. I slept very well, sure that Sabina, if she was around, was busy entertaining our Nordic pals. When morning came, our fellow castle-dwellers joined us for breakfast. They were quite disappointed: Sabina Nugent had been a no-show. As we drove away later, Rose and Julie were a little sad, knowing that they had missed their only chance to meet the Ghost of Ross Castle. I remain Doubting Elise when I hear tales of the supernatural. Someday, we’ll all know if we can return to earth to visit the places and people we loved. When that day comes, and if I become a ghost, I will not waste my time rearranging sofas, I can tell you that. I will pop in on my family and friends when they least expect it. I’ll moan, groan, turn lights off and on, and scare them all silly. I figure, if you only live more than once, and you’re gonna haunt—well then, haunt! Sorry about Sabina! Cheer up, girls!